On December 5, 2014, Ministers of Health from Brazil, Russia, India, China and South Africa (BRICS), countries, which collectively account for almost 50% of global TB cases, made a historic commitment to provide first line TB medicines for all people with TB in these countries. BRICS ministers agreed to implement various knowledge sharing strategies among themselves as well as with other low- and middle- income countries. Sharing technologies, identifying manufacturing capacities and securing TB financing were identified as key priorities. On photo Ministers of Health from Brazil, Russia, India, China and South Africa (BRICS). Photo credit: The Stop TB Partnership. In 2013 alone, according to the World Health Organization's (WHO) Global TB Report, nine million people contracted tuberculosis (TB) and 1.5 million died from this preventable and curable disease. Of the nine million, 430,000 people had a form of the disease that was resistant to multiple antibiotics. While TB is globally prevalent, roughly 80% of reported TB cases occur in 22 mostly low- and middle- income countries. Why is knowledge sharing critically important to public health? Knowledge sharing and management, provide a systematic approach through an activity (or series of activities) by which information is exchanged among networks and organizations. Knowledge sharing is a common approach to many recent public health solutions. When in 1993, the WHO declared a global TB emergency, and subsequently adopted the method for controlling TB, also known as "DOTS" model - Directly Observed Treatment, Short-course, developed by The International Union Against Tuberculosis and Lung Disease (The Union) - million of lives were saved. With proper leadership commitments, early acceptance of The Union's proven capacity to deliver, and a robust knowledge sharing approach among global partners, "DOTS" has been used to treat 56 million TB patients since 1995. Through strategic implementation of knowledge sharing mechanisms, The Union's model is also now being applied to other diseases from pneumonia to diabetes, further improving the lives of patients around the world. There are numerous challenges to implementing knowledge sharing strategies, and many can be divided into two categories: those we encounter at the micro/operational level and those encountered at the macro/strategic level within an organization or organizations. The knowledge sharing challenges specific to public health include early detection of emerging issues and the lack of technologies available to rapidly scale-up proven public health solutions. However, one of the most easily resolved challenges is the resistance to the sharing of knowledge at the individual level due to a lack of appropriate public health management skills. Brazil and China are among the countries that showed a sustained decline in TB cases over the past 20 years. Capturing lessons learned early can lead to broader life-saving impact throughout the world. As BRICS ministers come together to cooperate on scientific research and innovations on diagnostics and treatment, including drug resistance and service delivery of TB, the implementation of knowledge sharing strategies might prove challenging without proper training. As management training cultivates a more robust culture of information sharing, retention, and application; addressing this need is essential for sustainable public health solutions. Public health organizations that adopt knowledge sharing strategies and practices can improve performance of programs and quality of care for patients. Recognizing early the impact of management education on knowledge sharing, The Union's Executive Director Jose Luis Castro founded The International Management Development Programme in 2004. "The IMDP helps public health professionals gain competence and confidence in their ability to manage their programs, and build skills that directly contribute to improved quality care for patients," says Castro. And testimonials from students emphasize this. In fact, over 82% of the 2013 IMDP alumni survey's sixty-six respondents felt more confident in their leadership ability, and as a result, are able to positively influence others to follow their example. Some 95% of the alumni survey respondents shared the newly acquired IMDP course knowledge with their colleagues, creating a system of sustainable knowledge management. When pertinent information is exchanged in a timely fashion, human resources are strengthened and organizations are able to retain knowledge over time. Last fall, Shivakumar Mugudalabetta, a Secretary of Damien Foundation India Trust (DFIT), attended the IMDP's course in Project Management. Based on what he had learned, Mugudalabetta was able to develop a list of process indicators, such as: how many health facilities were trained in the screening of TB; how many actually implemented it; and how many actually increased the number of their TB diagnoses. "Each of these indicators will help us to monitor the [TB] screenings, find any challenges and identify solutions in a timely way, rather than just blindly continue the activity," explains Mugudalabetta. His next step was to share his new knowledge with DFIT's 11 partner NGOs, many of which are being asked by their donors for results-based action plans. Mugudalabetta invited the partners to a workshop on the topic last May. He is confident that they what he has shared will be tremendously helpful to them in ensuring that future projects have the greatest possible impact. 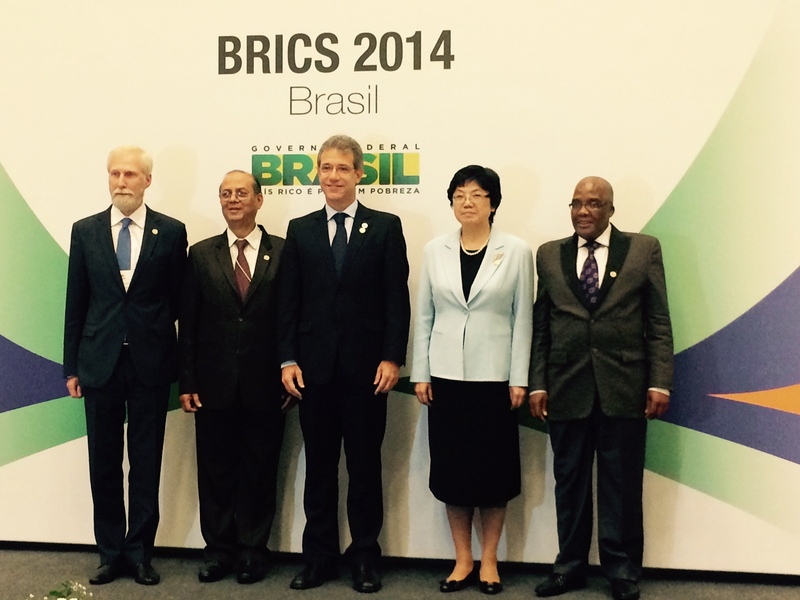 "BRICS countries have shown the world impressive leadership in the fight against TB through their agreement in Brazil. Sharing technologies was identified as a key area for action by the BRICS" said Dr. Lucica Ditiu, Executive Secretary of The Stop TB Partnership, "In order to translate the BRICS commitments into action, sharing knowledge, best practices, and research will be critical though different channels and opportunities - management training provided by The Union's IMDP is one example that can further support this process."